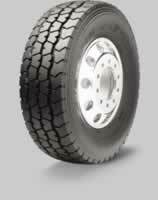 The MY507A is designed to provide outstanding durability and performance for wide-base on-and off-highway applications. Equipped with the latest Yokohama technology to extend casing life in tough applications, the MY507A is the perfect choice for vehicles such as concrete mixers, dump trucks and garbage trucks. Deep Groove Depth, combined with its Special Anti-chip Tread Compounding, enables the MY507A to provide long on- and off-road mileage, without sacrificing durability. Wide, Block-type Rib Pattern provides outstanding wear resistance and excellent traction in mud, snow and wet conditions. Funnel-shaped Grooves increase block rigidity for added traction, enhanced resistance against uneven wear and superior ride comfort. Stone Ejectors in the tread grooves guard against stone penetration damage to the casing, to improve retreadability. High Strength Belt Construction further enhances durability in on- and off-highway applications.